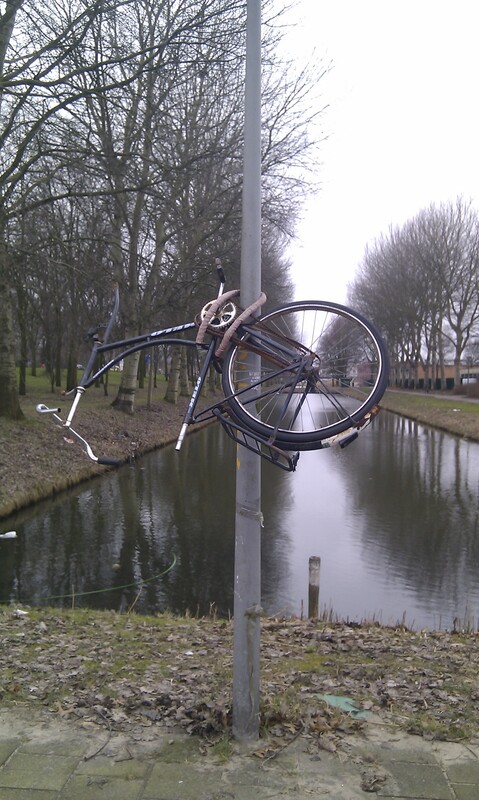 The Dutch have many strange traditions. 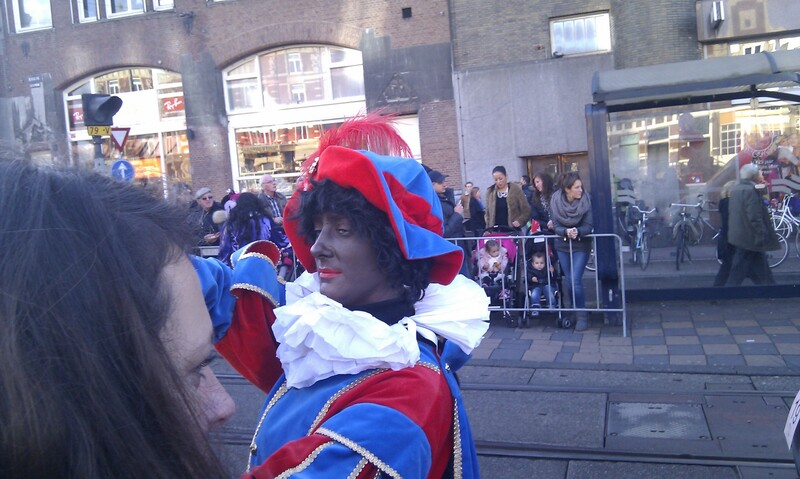 Perhaps one of the strangest is that of Zwarte Piet. Where Santa Claus in many countries has elves, in the Netherlands Sinterklaas has Zwarte Pieten, which is to say Black Peters. Men(and women) put on black face, paint their lips red and thick, and put on garish costumes reminiscent of those black slaves used to wear. The Black Peters are Santa’s helpers. They hand out “pepernoten”, ginger biscuits that the Dutch love, and they perform comedy and acrobatic acts. The Zwarte Piet tradition is one that would have you denounced as racist in South Africa (you may well end up in trouble with the law), but in the Netherlands Zwarte Piet is entrenched and accusations of racism have not (yet) killed this tradition. I am not a photographer. However, I find myself with a few photos of things in Amsterdam that I felt like photographing at that moment. 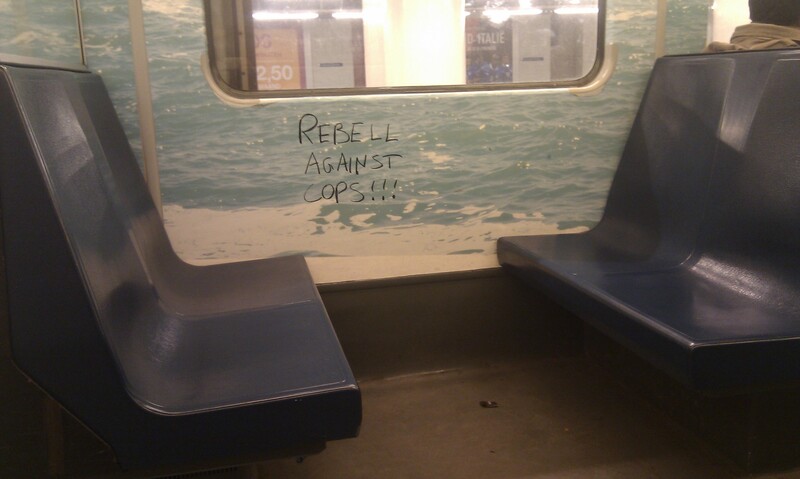 They’re not all peculiarly Amsterdammish, but I think now is the time to share them. These pictures were mostly taken in winter, so with Spring nearing (it’s still too cold to say winter is over) I feel like I should say goodbye to this winter and all the misery it caused me. First up is a picture of a bike in a peculiar position. In a city with more bicycles than people (yes, there really are more bicycles than people) bikes get up to all kinds of naughty things. In Afrikaans we have a saying “op die paal”, but that has nothing to do with poles or bicycles. 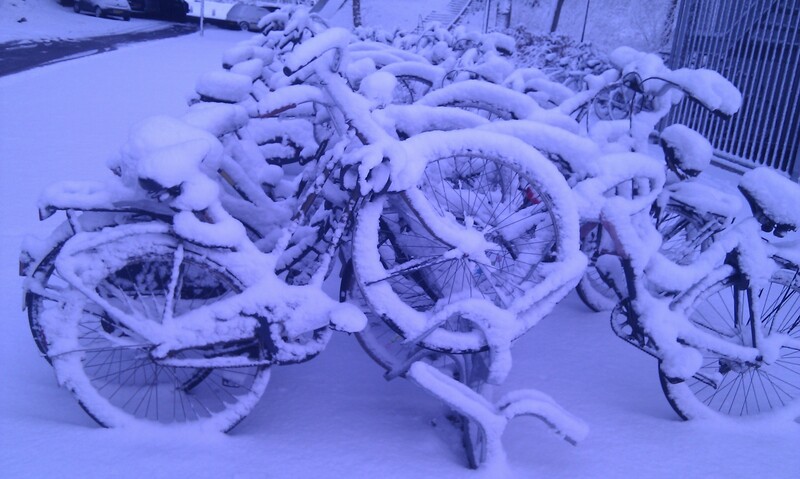 Next, bicycles covered in snow (mine is the one right in front). It snows in lots of places I know, but I come from a warm place with no snow. 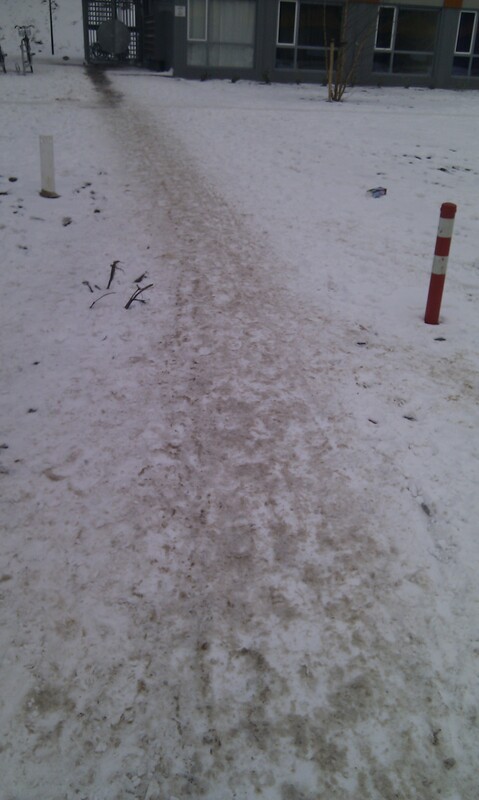 Snow and bicycles are an unhappy combination. Some dirty brown snow. I have mentioned in a previous post that snow is rarely white and pretty for long. It becomes brown, dirty and trampled soon enough. I am not the only person who thinks snow is overrated. There is one other Dutch person who also thinks so. One person could be mistaken but two never are. 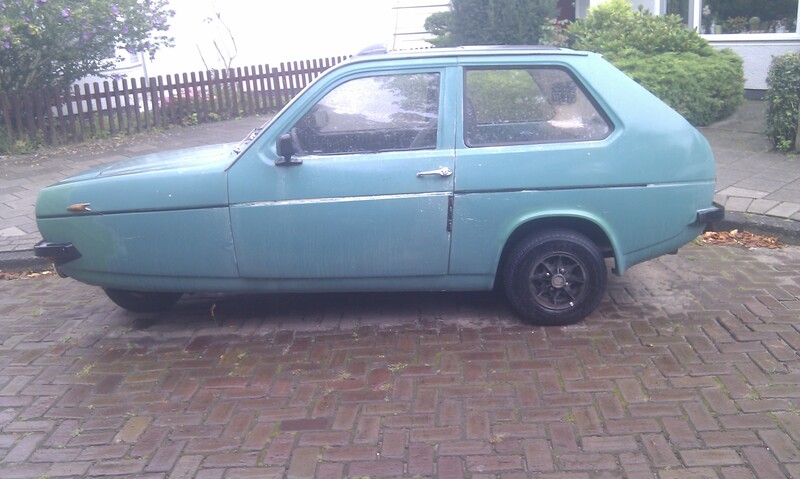 A three-wheeled car like the one driven by Mr Bean’s enemy. Did you ever think you would see one of those in real life? I almost felt like doing something nasty to it. But then I thought, that would make me Mr Bean, so I just took a photo. (Actually I did not think any of this, but I did think it would sound cool if I said so). 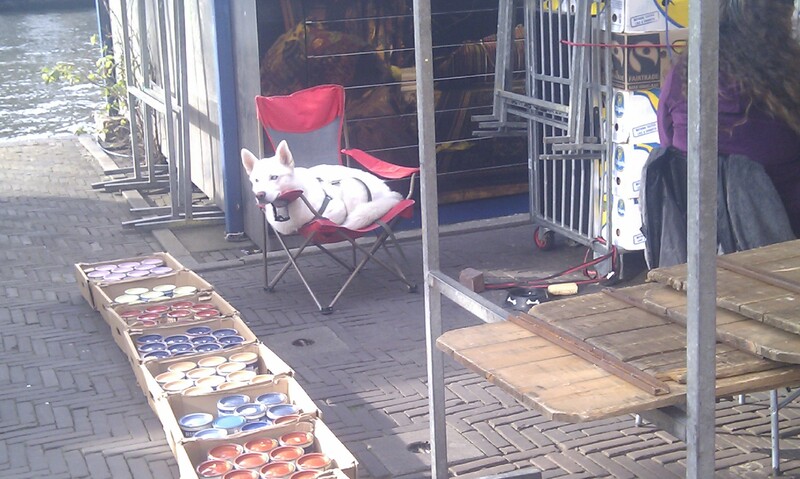 A dog in a chair at Waterlooplein. Amsterdammers love their dogs. It is a cute dog. Having basically had no summer for two years, I am considering becoming a sun worshipper. It is no wonder the Egyptians worshipped a Sun god. 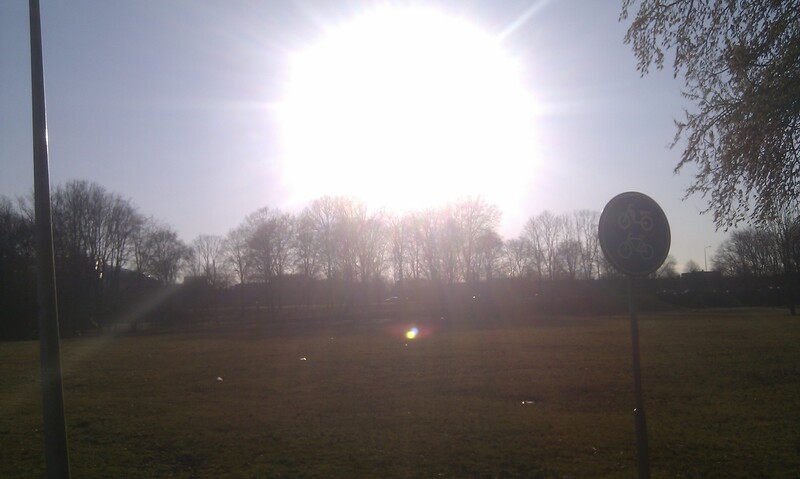 In the Netherlands right now the Spring is cold, but sometimes the sun shines. It is a weak sun that you cannot feel through the wind and the cold air. But if you’re inside, with insulated walls and glass, the sun through your windows can be warm and, if you don’t actually go outside, you may think jackets are optional. In a country starved for sunshine, you appreciate its power. In my case, its power to bring warmth not only to your home, but your soul. I recently read in a Dutch newspaper that there are 253 registered beggars in Amsterdam. Several things about this statement shocked me. 253 is ridiculously little. I don’t think any city in South Africa has so few beggars, even as a percentage of population (though I have not checked the figures –there may not even be any figures). The fact that beggars are registered and that begging is in fact outlawed (except, I suppose for these registered beggars) seems almost monstrous when you come from a country where almost every traffic light in every major city has children below the age of ten asking you for some coins. To deny so many people this form of income because it is a nuisance is something I cannot even countenance. There are too many beggars to register in South Africa and there are certainly too many people who live off begging in order to make it illegal (that said, I have not checked our laws, but I have never heard of anyone being arrested for begging). There are the children that I have mentioned, but many grown men and women too, mostly black. Increasingly, you also find white people with cardboard placards asking for help because they have no job. I make this distinction between South Africa is still a very polarised country. The white are rich, and except for a handful of elites, the black are poor. Of course, there are naturally people who take chances, who essentially con others via begging. (I have been conned into giving money to someone who supposedly needed it to catch a bus or a train, only to spot them in an another location not long afterward asking for the same thing.) One can argue that those children on SA street corners are being misused. They often are, I think. The Netherlands has the luxury to control its beggar population. South Africa does not. It is an administrative and man-power intensive task that our government and police force cannot handle. Nor is it one they should handle. There are far more important things to do. Ideally, I think, all “charitable” money would be channelled via organisations that could oversee the use of that money. I don’t know the state of the NGO space in South Africa, but I suspect it can’t solve all the problems. And a request for a donation from an NGO will never be quite as persuasive as a cupped hand in your face. In a country as divided as South Africa perhaps the rich need permanent reminders of their good fortune. Perhaps all it leads to is a habit of apathy. But one can be held accountable for apathy, not ignorance. I would like to see a day where South Africa is no longer has beggars, where it can have the luxury of outlawing such distasteful things. I do not think I will live long enough (and I plan to live a very very long time). I have often been one of those apathetic rich people (rich compared to most South Africans, that is). This little article in a Dutch newspaper has made me question my actions, and, importantly, my inaction.